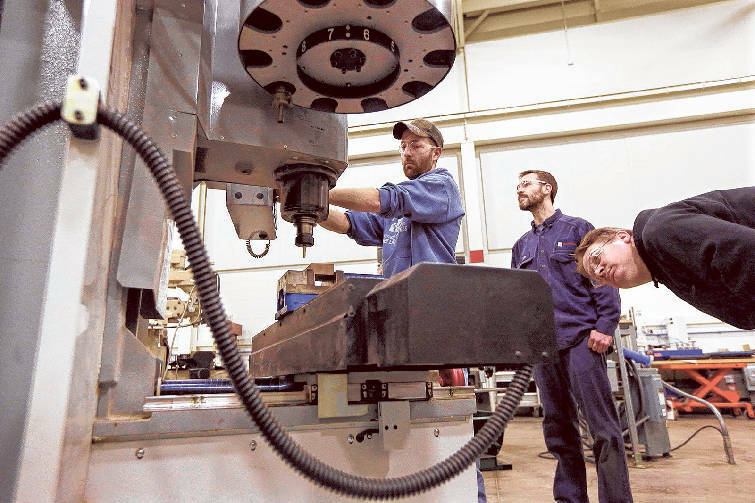 Brad Bancroft, left, operates a mill as Nate Joseph, center, and Adam Woodhams, right, look on in the advanced precision machining class at Lansing Community College, in Lansing, Mich.
2. Chattanooga. VW expansion and EPB gigabit Internet make the Scenic City poised for growth. 4. "Any city" in South Carolina. BMW and Boeing are each spending $1 billion on new plants in the state. 5. Milwaukee. A water technology research hub adds to diversified factory base from Harley-Davison and others. With Volkswagen driving new industry and EPB's high-speed Internet propelling digital tech entrepreneurs, Chattanooga is one of the five best cities in the United States for growing manufacturing businesses, according to the editors of Chief Executive magazine. Chief Executive lists Chattanooga among the top cities "that are catching [CEOs'] attention as U.S. manufacturing hotbeds, either traditional-and-growing or up-and-coming." Chief Executive magazine, a 42,000-circulation magazine targeted at company CEOs, cites both the planned expansion by Volkswagen of America and the city's efforts to capitalize on the fastest Internet in North America for its optimism about manufacturing growth in Chattanooga. David Buss, a writer for the Chief Executive Network, posted a blog entry suggesting that "many CEOs are in the midst of decisions right now about where to site or expand a factory." Buss said VW should draw more suppliers and boost manufacturing employment with the addition of a second vehicle line by 2016. Production of a mid-sized sports utility vehicle by 2016 should add 2,000 direct jobs and thousands of other jobs from automotive suppliers and their suppliers. "While sales of the vehicles built (in Chattanooga), the Passat sedan, have slowed lately, Chattanooga will get another bump when VW adds to its complex to build a new SUV next year," Buss said. "Just as important for the long run is that Chattanooga is now benefiting from the high-speed Internet network that the city's government-owned power board, EPB, installed. Manufacturers are sure to follow the digital-tech entrepreneurs and take advantage of the sizzling fast data network." Chief Executive magazine began publication in 1976 and regularly surveys its CEO subscribers and other CEOs for its annual survey of best and worst states and other lists based upon executive views of the economy. The magazine's favorable ranking for Chattanooga marks a comeback for a city that decades ago billed itself as "the Dynamo of Dixie" for its manufacturing muscle when about four of every 10 jobs were in manufacturing. Over the past 30 years, Chattanooga has shed nearly one third of its manufacturing jobs, even with the 10 percent comeback in factory jobs since the Great Recession five years ago, according to the U.S. Bureau of Labor Statistics. Metro Chattanooga ended 2014 with 30,500 workers, or 12.5 percent of the workforce, employed in manufacturing. Nationwide, BLS said 12.3 million workers, or 8.7 percent of the workforce, were employed in manufacturing jobs in December 2014. The Chattanooga Area Chamber of Commerce, which is wrapping up a 4-year, $9.2 million "Can Do" campaign to grow and recruit more business to Chattanooga, said manufacturing firms have invested more than $6 billion in capital investments since 2009. Such investments have come in the Chattanooga region from legacy companies like McKee Foods and from new manufacturers like the Mahindra tractor company. "We predict that the Chattanooga region will continue to top the site list when CEOs analyze where to expand or relocate," said Sybil Topel, the Chamber's vice president of communications. Tim Spires, president of the Tennessee Association of Manufacturers, said he's not surprised by Chattanooga's favorable ranking for manufacturing growth. He said he expects efforts by the Company Lab, the Gig Tank and other initiatives aimed at using EPB's gigabit-per-second Internet should aid manufacturing firms in the future. "This is a great location," Spires said. "Additive manufacturing depends a lot on high-data transfers and that is a real opportunity we see going forth that CoLab and the GigTank are working on. That will definitely make this one of the top five areas for growth in the future."